The use of mobile phones has grown exponentially from the first few users in the 1970s, to 1.76 billion in 2004, and more than 3 billion in April 20081. Sooner or later, these phones will be discarded, whole or in parts. In developed countries this quite often takes place sooner before they cease to operate. According to some recent studies, the first owner will generally replace their mobile phone within two years because they want newer features or because the older phones are incompatible with new services. In addition mobile phones are rapidly replacing fixed line phones in developing countries and countries with economies in transition. The result of that growth is a waste management problem when such phones reach the ends of their lives. The use of mobile phones has grown exponentially from the first few users in the 1970s, to 1.76 billion in 2004, more than 3 billion in 2008, and almost 6 billion mobile-cellular subscriptions in 2011. Sooner or later, these phones will be discarded, whole or in parts. In average, the first owner will generally replace their mobile phone within two years. The total mass of all mobile phones produced worldwide is tens of thousands of tonnes per year, and accessories represent tens of thousands of tonnes more. Also, the fastest-growing markets for new and used mobile phones are in many developing countries. The result of that growth is waste when such phones reach the end of their lives. 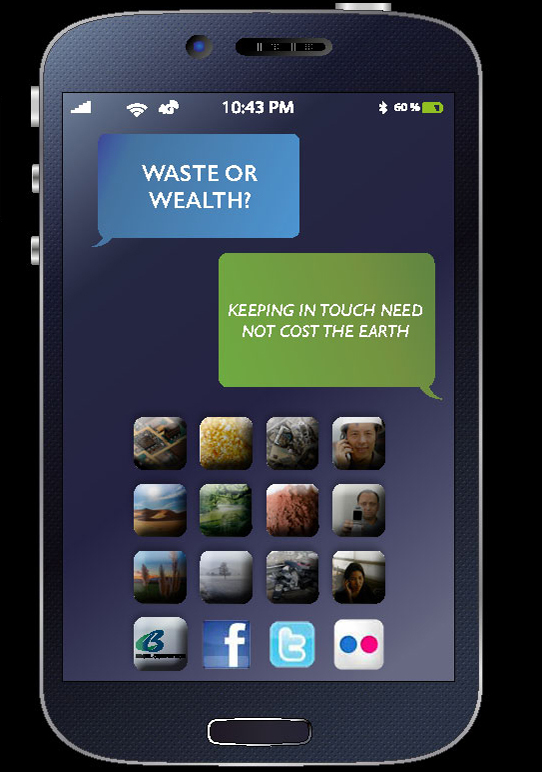 The issue of wastes from discarded mobile phones is, therefore, a significant one due to their sheer quantity globally and the possibility of pollution as well as the loss of valuable resources. 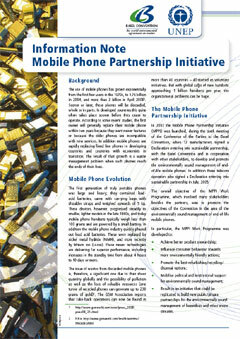 In 2002 the Mobile Phone Partnership Initiative (MPPI) was launched, when the sixth meeting of the Conference of the Parties to the Basel Convention established a working group consisting of experts from Parties and Signatories interested in a sustainable partnership on the environmentally sound management of end-of-life mobile telephones as well as representatives of mobile phone manufacturers and the Secretariat of the Basel Convention. Influence consumer behaviour towards more environmentally friendly actions. Promote the best reuse, refurbishing, material recovery, recycling and disposal options. Mobilize political and institutional support for environmentally sound management. Under the MPPI five technical guidelines (awareness raising - design considerations, collection of used and end-of-life mobile phones, transboundary movement of collected mobile phones, refurbishment of used mobile phones, and material recovery/recycling of end-of-life mobile phones) were developed. All these guidelines have been tested in a facility type environment and were revised accordingly. 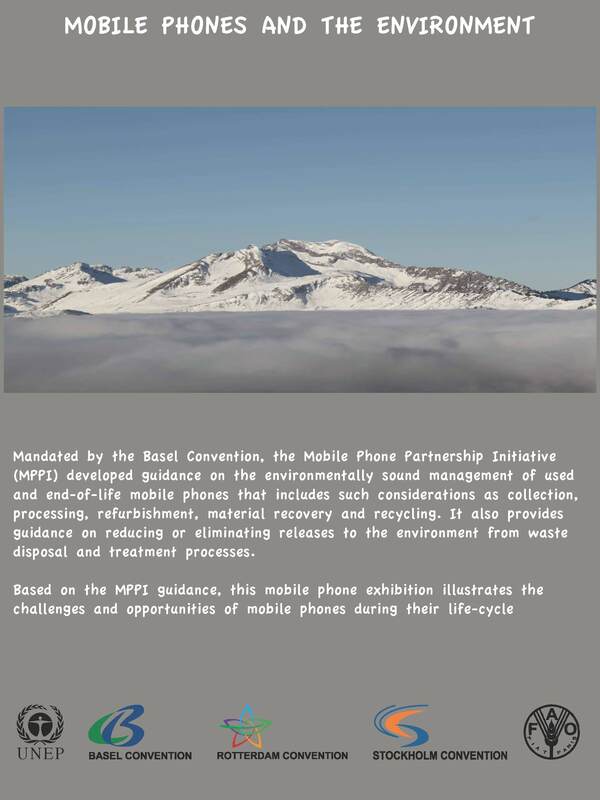 In addition an overall Guidance Document on the environmentally sound management of used and end-of-life mobile phones was prepared, which contains summaries and recommendations, taken from all five technical guidelines. Further, a Glossary of Terms was developed to assist readers to better understand the Guidelines and the overall Guidance Document. The overall Guidance Document was submitted to the ninth meeting of the Conference of Parties to the Basel Convention (COP 9) in 2008. Recognizing that the Mobile Phone Working Group had successfully completed its mandate, COP 9 disbanded the Working Group and asked an ad hoc follow-up group to carry out any remaining tasks. The ad hoc follow-up group revised the five technical guidelines and the overall guidance document prepared by the Working Group taking into account additional comments received from Parties, signatories and other stakeholders. The final guidance document was adopted in its entirety by the tenth Conference of the Parties to the Basel Convention, held in Cartagena, Colombia, in October 2011. Any follow-up tasks required, e.g. dissemination, awareness raising and propagation of the use of the guidance document and the guidelines, are carried out by the Secretariat, with the participation of interested parties, signatories, industry, non-governmental organizations and other stakeholders.